There was talk of magnetism and power points and such stuff. Some of us made a pact that we’d go up there when we reached 75 years of age and try and see just what was buried in that mountain. To go sooner, the logic went, would risk losing the experience of being human … kind of like looking behind the curtain & seeing the wizard. Those thoughts came back to me as I watched the S.F. Board of Supervisors on the tube. Often the most interesting things in the board meetings aren’t on the record. That happened last Monday, during the supes’ first meeting since the sneak attack on America. 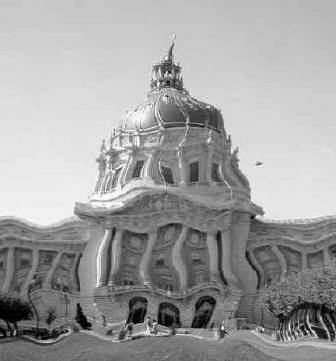 When the board adjourned, Gavin Newsom paused as he went through the swinging beautifully burnished dark wooden gates at the center of the sweeping matching rails dividing the 11-member board and the staff & press galleries from the princes and peasants in the audience. Directly behind the public speaker’s podium sat an Egyptian/American advocate for the homeless named Abdul. Abdul usually speaks first at Public Comment. More than once he has scolded Newsom. Newsom paused, elegant, slender, dashing, briefcase in hand. He paused and then strode two or three paces to where the aging, hulking giant in denims was starting to hobble out on his cane. And the golden boy of the new, rich emerging San Francisco embraced the passionate, aging representative of my generation. It was spontaneous and obviously heartfelt & it made me feel lots better about Newsom, San Francisco, and the world. How Americans treat one another is important to the entire world because it presages how our power elite will end up treating the rest of the earth. My 4th wife, the German filmmaker, used to say that all Europeans should get to vote for the American president because the outcome mattered equally to them. That was almost 20 years ago. By now, I’d guess the entire planet should get to help decide who sits in the White House. Watching Gavin and Abdul make a connection beyond class and politics made me recall what Supervisor Chris Daly said a few weeks back about “not feeling much love” in City Hall. Chris caught a lot of flack for the comment from the press. City Hall, the cynics mantra’d, is no place for love. The building has, as my people would say, “bad vibes.” You KNOW that can happen. City Hall is full of greed, ambition, cunning, confusion & desperation. (A lot like my last marriage.) Oh, it’s not just buildings that get infected with such bad vibes but also people, places, things, countries, cultures and, I’d guess, entire planets. Jimmie Carter spoke of a “great malaise” that had swept America. Maybe this terrible tragedy of 9/11 can have at least one positive outcome. We’re nicer to each other all of a sudden. No one yelled at the ump in the Giants’ first game back and we lost in the ninth … and it wasn’t really that big a deal. Ambivalence … attitude … anger … angst … our feet are in the fire. How do we respond? Mayor Willie Brown did a magnificent job of crafting a show to honor the victims of 9/11. It was definitely the finest moment of his career. Reverend Amos Brown asked if perhaps we should look to our own conduct as a nation for some of the reasons anyone could successfully carry out such a monstrous deed. I felt myself nodding as my mutated anger welcomed a legitimate new channel to pursue. I’ve gone from wanting to nuke capital cities to wanting to shower CARE packages over entire countries. Can good people stand with a righteous foot in each camp? It is truly a tough issue. A tall order this week. It’s a toss between poking fun at Supervisor Leland Yee and Norcal/AT&T Broadband/Sutro Tower lobbyist Robert McCarthy (he’s the one who looks like Mr. Toad in “Zippy the Pinhead”). McCarthy once told a board committee that he felt so good about the heavy-duty transmission facilities he was lobbying to install on public buildings that he allowed one of his kids to go to school and sit beneath one. The city’s rate board, chaired by City Administrator Bill Lee, and flanked by Controller Ed Harrington and someone from PUC had voted 3-0 for a 41 percent raise for Norcal (they pick up your refuse) over the next five of years. The Supes thought they’d like Budget Analyst Harvey Rose to do a little audit of Norcal, how it got the contract & how it sets rates & all that stuff. Which energized Mayor Brown’s only remaining automatic mouthpiece on the board, Leland Yee, to preach why this should be delayed. As long as possible. Send it to committee. Send it to Cleveland. Send it anywhere but to an honest budget analyst for an honest look. McCarthy did his best h. brown imitation. He was arrogant, sarcastic, and totally in the wrong. He gets paid to act that way. Lucky Mr. Toad. So, the thing rattled through with Yee casting the only vote to delay the audit. That was the last item of public business and the members started packing their yo-yo’s and bubblegum as Clerk of the Board Gloria Young read off the board’s regrets and concerns for 9/11. Board president Tom Ammiano started to gavel the session closed with the call of “Same house” — looking around, he sees no objections — “Same call!” when Supervisor Matt Gonzalez realizes that Yee (who is running for state office on Willie Brown’s coattails) has just been recorded as voting AGAINST honoring the dead, the American flag, and America. Imagine the posters Yee’s opponents could get out of that. But Matt saved him. The board rescinded the vote & allowed Public Servant Yee to record that he was only against an expeditious audit of a sweetheart deal some of the mayor’s donors got from some of the mayor’s appointees, not against sympathy and patriotism. There, I’m back in the swing, wounding the enemies of the people with the spear of satire. But it doesn’t feel so important anymore. I find myself thinking of taking a substitute teacher’s job up somewhere in the redwoods or maybe around Shasta. Have our leaders made so many enemies that we all must flee? They’ve chased the musicians and dancers and artists from San Francisco. The old and unwhite are packing. On TV the Afghan peasants pull crude carts full of their last material possessions while looking over their shoulders in fear. In San Francisco’s UN Plaza, the poor do the same. I recall the words of an SF realtor busy evicting tenants, “It’s not personal. It’s business.” And we wonder why people come to hate us. Maybe we can go to Mount Sutro and check the basement for magnetic/geothermic/gravitational bad vibe machines? Naw, we’d never get in. I know who’d be there guarding the door. … Mr. Toad.